Most if not all house buyers will require financing to buy their dream homes. While there appears to be stiff competition among banks for market share and interest rates may be kept low, house buyers are ultimately at the mercy of banks when it comes to the detailed terms and conditions of the housing loan. (Banks in this context refers to commercial banks, Islamic banks and other financial institutions). When a borrower takes a housing loan, the borrower is required to execute a loan and other related agreements. This entails the borrower having to pay legal fees, the amount of which varies, depending on the loan amount – the higher the loan amount, the higher the legal fees although the complicity and level of work does not necessarily commensurate directly with the loan amount. Although it is the borrower paying the loan lawyers’ fees, the said loan lawyer is actually acting for and on behalf of the bank. As such, the loan lawyer is not in the best position to advise the borrower if there are clauses in the loan agreement which are not in the best interest of the borrower. In addition, in the event of any dispute between the borrower and the bank, the borrower cannot ask the loan lawyer for advice as the loan lawyer is acting for the banks. If this is the case, then is it “fair or equitable” for the borrower to pay such legal fees when it is clear that the lawyer is actually acting for the banks? Obviously not. Hence, the bank should absorb the legal fees as the lawyers are clearly there to act for the bank and protect its interest. The banking sector in Malaysia is a very tightly regulated industry. Any fees that banks intend to charge must be approved by Bank Negara. It is disheartening to note that borrowers continue to be charged exorbitant fees which seem to have the explicit blessings and consent of Bank Negara. Instances of borrowers being charged unreasonable fees for copies of redemption statement, EPF statement letter etc are common. Albert took a 20-year HL. Eric took a 25-year HL and Jamie took a 30-year HL. After servicing their monthly loan instalments diligently for the past 10 years, they decided to fully settle their housing loan using a combination of their EPF monies and own savings. When they asked for a redemption statement to find out what was the principal sum outstanding, they received a shock of their lives. Albert, Eric and Jamie were under the impression as they had served 50%, 40% and 33.3% of the loan tenure, their principal sum outstanding would be RM250,000, RM300,0000 and RM333,333 respectively. 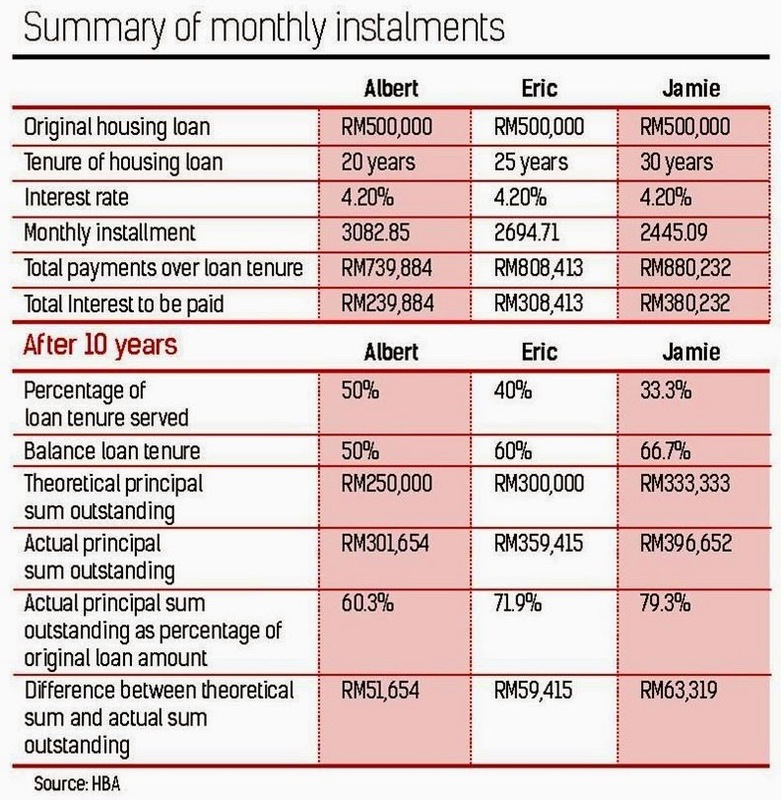 So, when their respective redemption statement showed that Albert, Eric and Jamie still owed respectively RM301,654, RM359,415 and RM396,652, they got a big shock. So, why did they still owe so much more than what they had thought? The answer lies in the allocation of the monthly instalment towards covering the principal sum and interest charged by the bank. In an equitable world, the monthly instalments would be allocated on a “straight line basis” to cover the principle and interest charged. Thus, a borrower who served 10 out of a 20-year HL would only owe 50% of the original loan amount. However, the reality is that the borrower still owes 60.3% of the original loan amount. The typical borrower will always be “penalised” for settling his loan before the maturity date. Even in the penultimate year of the original loan tenure, the actual amount outstanding is still higher than the theoretical amount, which should be the amount outstanding had the allocation of monthly instalments been done on a straight line basis. Most borrowers do not know or even understand how this allocation is calculated. Is such an allocation “fair and equitable” to the borrower? Under such circumstances, are borrowers supposed to accept that the bank’s own generated computer system has calculated the interest correctly and allocated the payments in the correct manner? To the borrower, they have paid 10 out of a 20-year loan, he should only owe balance 50% and not 60.3%. Is this manner of allocation not just another unjust way for the bank to generate higher profits, after all the bank did receive the payments on time and in full every month. It is the dream of every borrower to be debt-free as soon as possible and it is not fair to the borrower to be penalised in such a manner when he wants to settle his loan early. That said, borrowers have no choice but to accept the calculation of the bank as correct and final. If the borrower were to reject and not pay the required sum, the loan will not be considered as repaid in full. The borrower could even be blacklisted and even have his property auctioned off by the bank to recover the remaining sum outstanding if the borrower refuses to pay up. It would be more transparent and equitable if the monthly payments made by the borrower are allocated in a “straight line basis” to interest and principal equally over the tenure of the housing loan. Short of that, borrowers are at the mercy of banks. Some banks operate like a “cartel” and standardise their fees to be charged to customers. One wonder whether such unfair practices are condoned by the regulators like Bank Negara. It is also interesting to note that banks are exempted by the Malaysia Competition Commission allowing banks to agree and collude on unfair fees, penalties and practices to be charged to borrowers. Loan agreement “printing charges” – sold between RM150 and RM350. The banks’ solicitors need to purchase a standard loan agreement from the bank (via soft copy) and adds the borrowers’ details in order to complete the loan agreement. The banks charge the lawyer and the lawyer charges the borrowers. Standard loan agreements are now downloaded from the bank’s website or from soft copy. The bank no longer need to print them and should not charge for such documents. Alas, this has been continuing till to date. Lopsided terms and “add-on” products are aplenty, if the borrower wants to identify with them. It would be good practice to remove or qualify the banks’ arbitrary powers. The National House Buyers Association (HBA) had on Sept 4, 2014 made representation to the Finance Ministry (MOF), Bank Negara. Housing and Local Government Ministry in the presence of Association of Banks Malaysia and Islamic Banks of Malaysia in the form of slides presentation on some observations and unethical practices of some banks. HBA is looking to work closely with MOF, Bank Negar and all related stakeholders to level the playing field for housing loan borrowers in the long-term interest of the banking industry. We had proposed to set up a working committee to resolve all unfair practices. MOF and Bank Negara have a legitimate interest in the final shape of the banking industry into operating a principled and towards a “customer friendly arena”.